As stated lower in this post, when I started this project, I reached out to Knievel and asked him for his control panel work files. After some digging, he was able to find them. I had them posted originally with a 7th button mod, but those were in the wrong place and I pulled them. I have gone ahead and done a little work on his file. I removed the button with the issue, and consolidated his two files (staggered buttons and straight buttons) into one file. Also, I went ahead and added the enclosing rounded rectangles that enclose all of the buttons. They are ready now to just drop artwork into. During the course of my project, I have redone this with a new shape and in both illustrator and photoshop. Illustrator for the shape and button positions, then photoshop to actually do the artwork. The illustrator file is great because it can be sent off to a company to get the plexi cut. The photoshop file is nice for printing and doing your woodwork. You can print it at 100% then use it to cut the shape and I have pinpoints in the centers of each button to help with initial drill placement. I am posting the illustrator file as it is nice and small. The photoshop file has some meat to it though and is too big to put into this form. If anyone will host it, I will make it available. These are of my new shape, but I will probably recreate knievels shape in this same manner as well as I know this is a highly sought after shape/template. Well I've had this project rolling around in my head for about 5 years now. 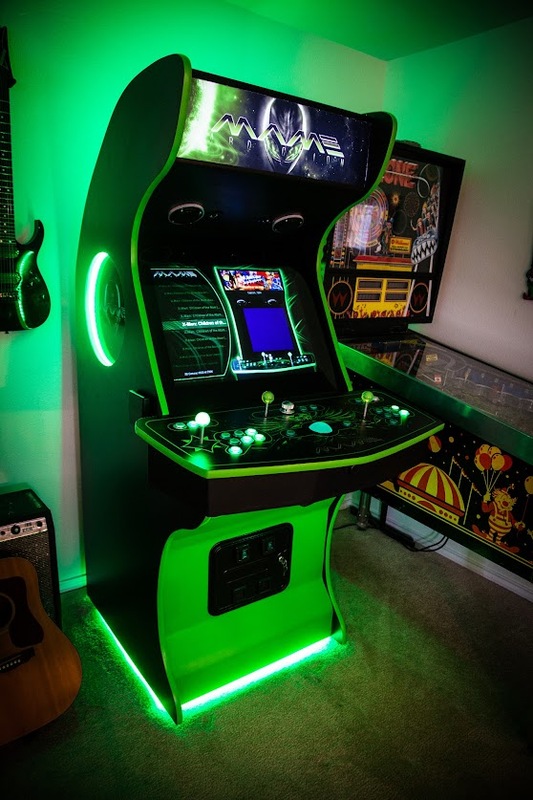 2 years ago I started it, pretty much totally inspired by Knievals NEON MAME: http://forum.arcadecontrols.com/index.php/topic,30538.msg257557.html#msg257557, but black and green with an Alien twist (Not the movie.) 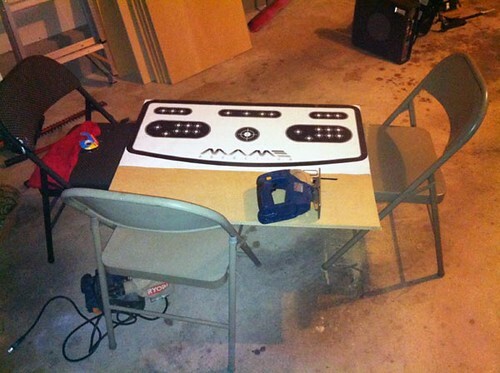 So I Bought the MDF, cut the cabinet sides, then other things happened and the project went stagnate. Two weeks ago the sides were staring at me, just laughing at my inability to finish, or even make any real progress on this project ... this got to me, so I started back into research mode, and what did I find? 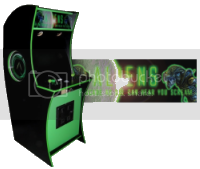 A totally killer Alien cab built by Epyx (http://forum.arcadecontrols.com/index.php?topic=96465.0). Wow! 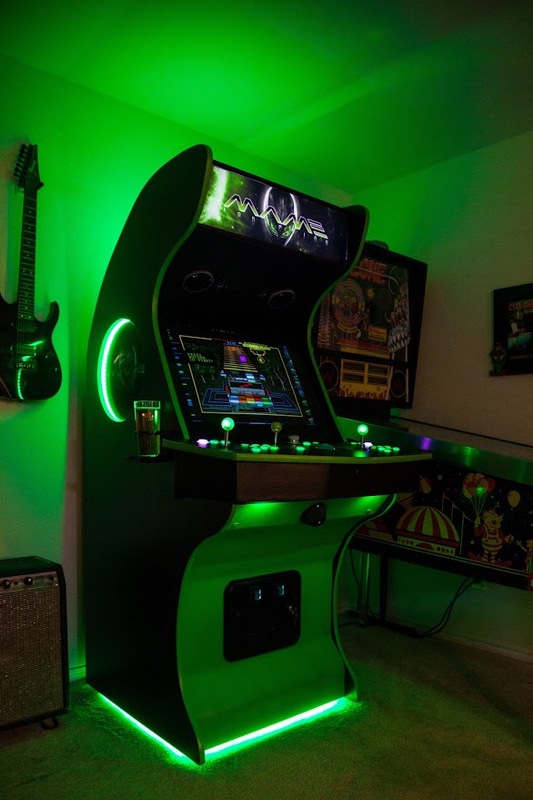 I must say, this is one of the most amazing cabinets that I have ever seen, and almost totally on spot with what I wanted to do; green and black, well lit up, neon ring, you name it, this cab has it all. It even went a step further with the awesome cab shape. And it was totally in line with what I had wanted to do a while back. That was all of the convincing and inspiration I needed ... It was back on. I reached out to both of the ArcadeControls Rockstars, Knievel and Epyx. Both are totally nice dudes and willing to offer their advice and in some cases some of their work. I will share what they have shared with me as I go through this process to save others time. The plan is pretty simple, and has not veered from what it was 2 years ago. 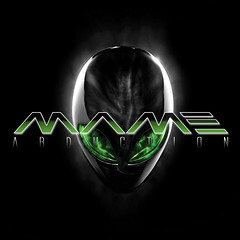 NEON Mame with an Alien twist. Now it just has Epyx awesome work to make it better. Namely that lamination job and a few other tweaks. I also have a couple of pretty cool ideas of my own, more on the technical side, as I am a tech/designer, not a wood crafter, but I will get to those. I really like the way Aliens vs. Predator did the letters in their logo, so I sought to incorporate that in mine. It was surprisingly hard to find an AvP font that works on Mac OSX Lion, so I just created the MAME letters from scratch, styled them like AVP, and found a cool Alien Ware head someone did. Side Art: Just a rehash of the Marquee, intended to get dropped behind a cutout circle on the side, and accented with a neon green speaker ring of course. Control Panel: I reached out to Kneivel, and after some digging he found the Photoshop file he had used for this. I modified his 6 button set to add a 7th thumb button, expanded the rounded boxes around them to accommodate the space. 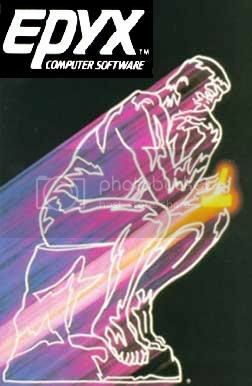 I have looked and looked to try and find an image as cool as the one Kneivel used, but I just can't seem to top it, so for now the cosmic frostbite image is there. I will say though, anyone looking for really cool images to work with, http://www.deviantart.com/ is the place to go. This is where he originally found his I believe. He said it was cool to share the artwork he gave to me, so it is attached. I will upload all 3 versions I have. The two he gave me with the 6 button sets and no backdrop, and the modified one that I have worked up that includes the extra thumb button. This weekend I am going to go ahead and get the wood for the front and back pieces, as well as the bottom. I will get those cut and ready, then start thinking about the routing and lamination. Welcome, looking great man! Can't wait to see it come together! I love me some green cabinets. Love the theme. Nice artwork so far! Wow, if the rest of the cabinet is half as good as that artwork, we're going to have another good looking cab. You thinking about going with black or green (or better, green lighted) buttons with that artwork? Looking good. Love the artwork and theme. Keep us updated. Im probably going to go full on lit buttons like Epyx did on his. Do you know of a project where I can see what you are talking about? I am definitely open to suggestions. Maybe like this? (Page 4 of my project) http://forum.arcadecontrols.com/index.php?topic=88912.120 or check out Franco B's versions of these which are better. Man, I can't wait to see this project progress! Love the art work btw! It's funny how so few people use green, and yet everyone loves the green themes. Ok, so I bought most of the rest of the wood needed a couple of days ago and am going to do some work this weekend. I already have the rest of the MDF cut to the width of the cab and ready to be trimmed down to the height needed to do the back and front pieces. I probably wont do anything with that yet as I plan on routing the wood first (still looking for the right bit) and building the base first. On the base, this is going to be a freaking heavy cab, so I am going to get some gnarly casters. If anyone has any recommendations on cheap ones that are strong let me know. If not, I will be doing something rated between 150-200lbs a caster. I think that should work. 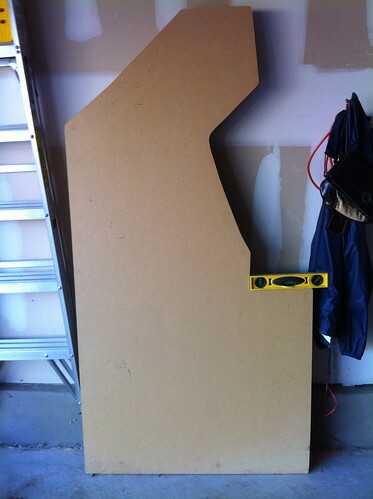 The wood work I am going to do this weekend will be getting the base and control panel started. The base is going to be built individually with MDF and Pine for strength, then teh cab will be built upwards from there. 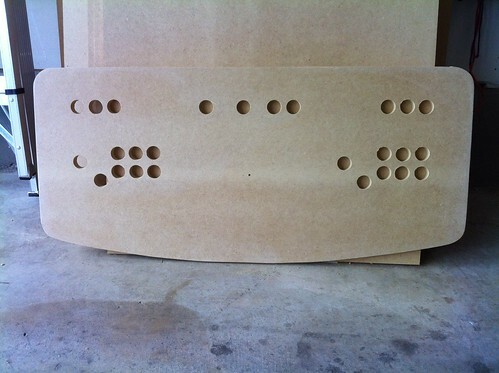 The control panel is where I am a bit sketchy on how I am going to get the shape right. The artwork I have done has a very distinct trim line in it. The idea is to get the shape of the wood to match that trim line exactly. I talked to Knieval and he said that he had actually created the wood template first then created the artwork. Well, I dont have that nicety, so here is my plan: I am going to take a black and white version of my template and have it printed someplace that does large prints. Not sure if Kinkos will can handle prints this big, but I know the local grocery store can do it on photopaper, but that is a little pricy. So, printed on normal paper, I can tape this to a piece of mdf, then cut along the black trim. This black trim is about an inch of separation from the green line to the edge of the CP. If cut well, it should give me a perfect shape, I hope. So that's the plan. Im open to suggestions if anyone has been through this before. If not, I will let you see out it turns out on Sunday. Kinkos near me has two plotters. B&W full size CP print was like 79cents or something. Not bad for a template. Hope you find a deal that good. Ok, well I had a pretty successful night last night. I was able to get the template printed, and cut. Overall things went well. The shape cut: If I was going to do this again, I would trim all of the white from around the paper template. It got in the way and made it hard to see where the jig was at. And the end result minus the trackball hole. Im not 100% sure which one I am getting, so I am going to hold off on that hole for now. There were a couple of hickups, but overall I think it came out good. Now it's on to the base of the cab. I have an idea how I'm going to approach this, but I think I will scour the forums some and see if I can find someone who has done it "right". If you know of any, drop a link. As far as your buttons you might try this option. Middle of this page http://forum.arcadecontrols.com/index.php?topic=96162.80. It's not as hi-tech as Ond and Franco B's, but it worked out well for me. One thing about full lighting buttons is the led tends to shine directly in our eyes at some angles and it throws a ton of light to the ceiling. I took translucent and black buttons popped out the black plunger and stuck it in the translucent case. Give your buttons a nice look i think. +1 on the solid/translucent button combos. If you go with those (or any buttons with translucent bodies, and only have active buttons lit for that matter), there is a chance you will have some light bleeding into unlit buttons from lit neighboring buttons (and color mixing if you go with multiple colors or RGB LEDs). The bleeding was horrible on my panels, but I have much thinner metal control panels. Might not even be an issue with 3/4" wood panels. I took care of it with some heat shrink tubing, but there is a laundry list of things you can do to remedy it. Light bleeding while lit for MK3. No light bleeding after fix. One more note IL stopped making the clear translucent pushbuttons. So if you plan on going this route, you might want to snag some up fairly quickly. You might look at lizardlick.com, they still have these buttons posted to their site. 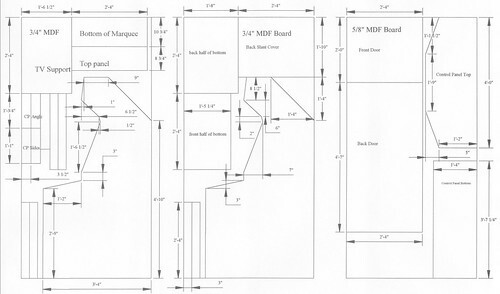 Thanks for the link Shaner, nice to see your project up on this website. I gotta say I LOVE the artwork you have planned. Looks terrific! Also, I would highly recommend the buttons Ond shows above for the exact reason Rablack97 mentioned...although my full on lit buttons look great at a distance they are distracting while you are looming overtop of them. I almost never have them fully lit...only at the start of the game to indicate buttons used for games and then they are turned off during gameplay. If I were to build this cab again I would do them Ond/FrancoB style. Ill be checking in frequently here to see your progress. Any questions as mentioned just ask! When choosing your casters I wouldn't worry about the weight. Focus on the diameter of the wheels. If you aren't 100% positive this will only be on wood floors and concrete, a larger radius wheel will allow it to roll over carpet without warping the carpet. I put some big 3" casters on my cab rated for some really really big weights. Pushing it around on carpet is really easy. Ok, I'm sold. I am going to take the OND approach for the buttons. Crazy creative by the way OND. The question on these is going to be, do I go green or black. I am leaning towards green, the only problem with this is the green buttons that are sold don't go that well with the Galaxian green T-Molding. Decisions decisions... Im going to order these this week and go ahead and get started on them. They seem like a good "In between major updates" kind of job. Thanks Giant on the caster advice. Ordered my 1/16" router bit off of tmolding.com today ... hopefully will get it before the weekend and I can start routing. Ahh and also rolling around the idea of cutting into the cab a little to make the shape a little cooler. Not much, just a tweak here and there ... :-). We will see what a little time and a few beers leads to. Ok, just ordered some buttons and am going to get to cutting them up as soon as I get them. A question for you EPYX, or anyone with experience here, you said the LED lit buttons were a distraction, what about the joysticks? Were they ok lit up? Can someone post a link to Franco B's button job? I have been looking forever now and cannot seem to find it. Ninjasquirrel's is here. Another take on Ond's. Just a minute while I find my Franco bookmark... it can be found here. Page 3 of his Naomi build. Check out page one for a ---smurfing--- sweet clock. Wow, Ninjasquirrel's buttons are the $h1t. They look like they would light up the control panel a little better than some of other versions I have seen. I am definitely going this route. Thanks for the link Le Chuck! Sorry for the late response...I found the lighting to be more of a distraction than it was worth for me personally but don't get me wrong I still turn it on from time to time...ie when I have a buddy over for some two player but even then after a while I usually end up turning it off. Would you recommend then just setting it up for an attract mode and then to flash the game buttons at the begining of a game and go off? I have the same sticks as Epyx, I've never considered lit ball tops as a distraction when playing. You have to consider a couple of factors. 1. There is a smaller led in the sticks I think 3mm and plus the light gets diffused as it travels through the bubble top. 2. 5mm leds are used for the buttons and firing throught the clear plunger of the button which is magnifying the light. So it would get annoying to the eye to have 6 or 7 magnified leds shining right into the lower site of vision. Also, if you wanted you can use led blinky and set the level of brightness on all your leds. Although if you want to go through the trouble of creating Ninja squirrels buttons then you wont have this issue. I'm not a big fan of 'MAME' artwork, but your AVP style is fabulous! Thanks dandare, I'm pleased with the marquee and the side art. 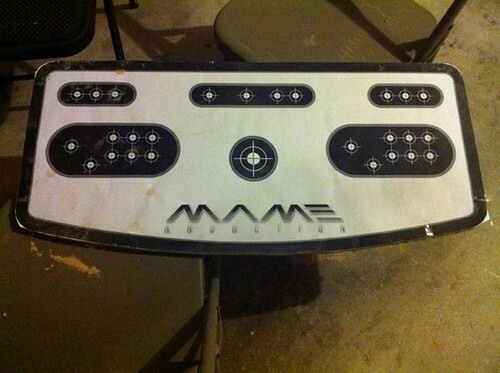 I am seriously debating taking a stab at something for the control panel though. Cosmic Frostbite really is perfect for this use because of the way everything spreads out from the center where you end up putting the trackball, but so many people have used it, it seems a little played out. I'll see if I can come up with something unique, if not I have this one for a backup. 1. I don't have a miter saw, and would prefer not to buy one. I can think of at least two edges that will need an angle cut on them so they meet well with another piece of wood. Namely the very back with the angled top back slant. Any wood workers got a trick for these edge cuts? 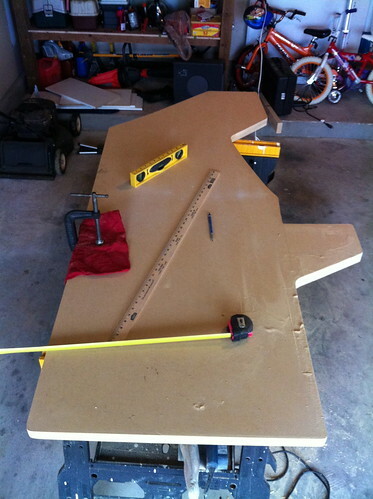 Also when I build the control panel, I will need to cut 45 degree angles on the 4 box sides to fit them together. 2. Epyx or anyone else... Im trying to find some demnsions on some neon rings somewhere but have not been successful yet. I would like to try and cut the circles in the sides of the cab today and need to figure out whether the rings are 15" on the inside or outside. I would assume 15 on the inside, but dunno. Ok, off to start the base. This is what i was going to do, but i didn't have to in the end as my boss at work gave me use of the table saw which is adjustable to 45 degrees, may be worth asking around relatives/neighbours etc to see if anyone has an adjustable table saw if its just for a couple of cuts. would you be willing to share your artwork please? Dont be jealous of my ghetto clamps. I will more than likely share it once the cab is done, I dont want anyone showing me up before I am finished. If your gonna incorporate speaker rings, the inner diameter for a 15" speaker ring speaker ring will be about 14". Cut a 14" hole and you should be fine. Check out this link http://forum.arcadecontrols.com/index.php?topic=31417.0, Knievel's tutorial on mounting these things to your cabinet. I followed this and mounted lumin discs with my speaker rings. Keep in mind as you will see in the tutorial the overall hole size will depend on how much of a glow that you want, smaller the hole the less glow you get. If your too afraid to screw up your sides, order your rings first and trace the inside, and use the router to cut your circle. I used a 12" speaker ring and cut a 11" hole, and it worked out great. Also, I would secure your speaker rings as well, folks have stopped manufacturing, and retailers are basically selling out their inventory, especially on the 15" rings. Epyx had a hell of a time getting his 15" green ones and he had already cut his holes. Luckily, I helped him locate a set on ebay, and that was a few years ago. I can identify with those clamps, use some scrap blocks and clamp to those, that will keep those hideous clamp circles off your baby.